See Robert Bosscher perform in these recent videos. Ik woon nu weer in Nederland na 7 jaar in New York te hebben gewoond en te hebben opgetreden in verscheidene jazzclubs. Naar aanleiding van een aantal leuke, geslaagde avonden/middagen in verscheidene zorginstellingen werd ik zo enthiousiast dat ik besloot mij voornamelijk te focussen op muziek uitvoeren in de zorg. Er gebeuren prachtige dingen tijdens de concerten. Bewoners leven weer helemaal op en zingen enthiousiast mee. Achteraf heb ik vaak nog met hen een leuk gesprek. Vier tachtigers van De Uylenburgh aan de Lauriergracht in het centrum zagen een bijzondere kerstwens in vervulling gaan. 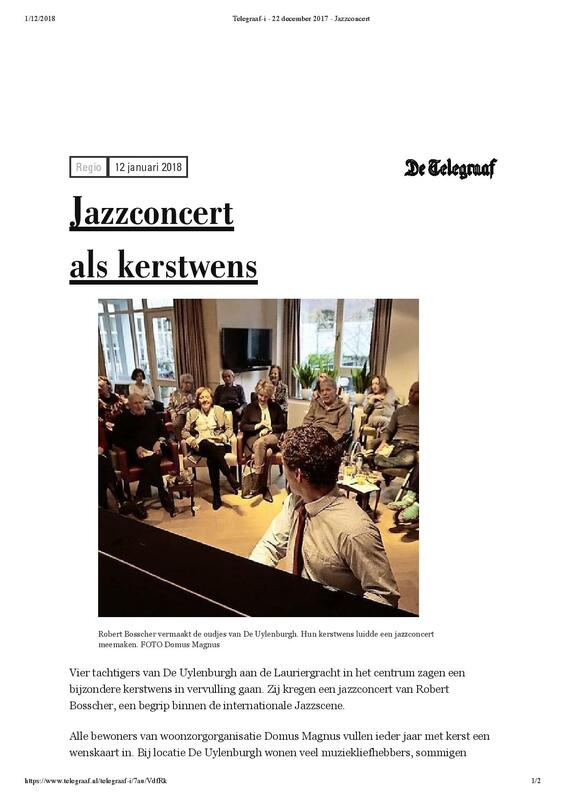 Zij kregen een jazzconcert van Robert Bosscher, een begrip binnen de internationale Jazzscene. Als musicerend en docerend pianist heb ik jarenlang internationale ervaring met lesgeven op alle niveaus. Van spelend leren met jonge kinderen tot het delen van de ‘absolute vakgeheimen’ met gevorderden. Ik geniet ervan om leerlingen te zien groeien en plezier te hebben in het muziek maken. Als docent ben ik kundig op een breed gebied, eerlijk en weet ik de balans te houden tussen uitdagen en motiveren. Een helder doel is het uitgangspunt van de lessen, zodat ik de inhoud van de les precies daarop kan aanpassen. Je leert wat je wilt leren! Smith succeeds that cut with some more obtuse blowing transferred over from the first track just before pianist Robert Bosscher angularizes things, doing the same again in Sonny Rollin’s Blue Seven, transfusing some old barrelhouse right into the equation. Senor Blues, my favorite cut, becomes a weird but way cool alien festival sequence blending several World modes, violinist Efrat Shapira bringing things back to cognizability. I mean, everyone goes be-boppin’ nuts on this one. Saturday night at Banjo Jim’s, Murphy delivered an especially intense show backed only by Amsterdam-based pianist Robert Bosscher, who proved to be the best musician Murphy’s ever played with, hands-down (and Murphy’s always been a magnet for first-rate players). Murphy’s songs are rich with bluesy melody, and Bosscher – a jazz guy playing rock and blues, and loving it – seized every opportunity. The celebrated bassoonist proves just as at home fronting a jazz lineup as a chamber orchestra, and provides a delightfully quirky, decidedly avantist voice to a lively set of jazz & r&b classics. His group and guest partners contribute straighter but definitely spirited work themselves, particularly pianist Robert Bosscher, guitarist Ron Jackson and violinist/violist Efrat Shapira. One day a guy enters the Swing Master record store owned by Sem van Gelder. The guy is relaxed and in his hands he is holding some CD’s which are for sale. Van Gelder puts on the record. The customers in the store sit down to have a listen. Before the first track ends the deal is made. Robert’s album ‘Multiple Views’ is a wonderful release with an outstanding line-up: Joris Teepe (Benny Golson, Chris Potter) -Bass, Billy Hart (Herbie Hancock) -Drums, Mark Turner (Brad Mehldau, Fly) -Sax, Scott Wendholt (Village Vanguard Band) -Trumpet. The record takes off strongly with ‘Staying Real’ clearly setting the tone with East Coast-jazz. The track ‘Fierce’ especially is full of interesting harmonic and rhythmic directions. The titel-track ‘Multiple Views’ is a quite dreamy but very pretty trio-piece. In the liner-notes Robert says his album is a reflection of daily life with it’s many influences and perspectives. At the end of the album we hear those many influences and perspectives in ‘Echoes From My Mind’ and ‘Wondering’ which includes opera-style vocals. 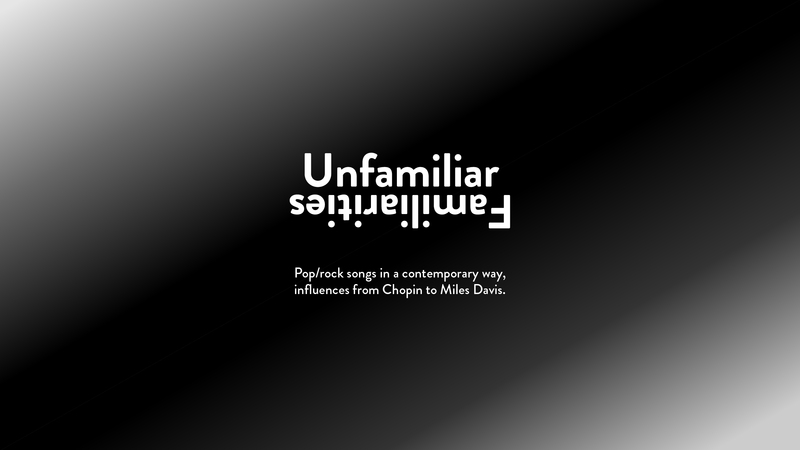 The album’s ambience changes quite drastically here and experiments like these seem to rather fit another album. Luckily inbetween these two vocal-tracks there’s the brilliant ‘Brainstorm’ again putting the emphasis on the Quintet. 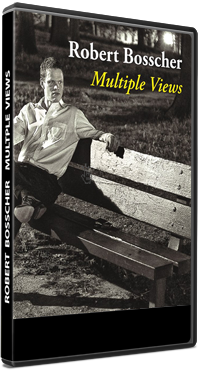 With ‘Multiple Views’ Robert Bosscher truly delivers. A successful record-deal should follow up soon. Recently Robert has recorded a new album with Summit Records at Stadium Red Studio’s.